Circling back to this post as Day 20 of 90 x 90. Preparing to engage students early next week on cinematic narrative. A vast subject, of course. In recent years I have enjoyed reflecting upon screen-based sequences as a pictorial communication medium. Cinema has become the global language, after all. Unlike pages (which can be controlled by a "user") or sets of comic panels (which may be manipulated into unequal segments by a composer), screens really are modular units, by iron decree of the technology. Television sets (increasingly quaint, that term!) and movie houses (even more anachronistic) present a sequence of images in a set format, which cannot change. This is not really a sacrifice, except to the most relentless avant-gardist. Who has ever sat in a theater and thought, "Gee, I wish that rectangle would change. I'm bored by it." We take the screen format as a given; we watch what unfolds within it without much thought of the visual container. But the logic and grammar of screen sequences had to be worked out. A significant distinction must be drawn between cinematic versus theatrical story-telling. Sergei Eisenstein's theory of montage (image A plus image B equals associative leap C) isolated important narrative concepts. Some years back I saw an exhibition at the National Gallery tracing the career of Charles Sheeler, he of the grain elevator paintings and River Rouge photographs. I was astonished to discover an obscure 9-minute film Sheeler created in association with Paul Strand, pioneering modernist photographer, in 1921. The scarcely-narrative film shares a title with a Walt Whitman poem: Manhatta. I don't have time at the moment to discuss it in the detail it deserves, but suffice to say it's a visual poem devoted to Manhattan. Both the film and city feel homeric, as in early, vital and somehow authoritative. The film is available here for free streaming, courtesy of the Library of Congress, which appropriately identified it is as culturally significant. The film really knocked my socks off when I first saw it in 2005. It influenced my own experimental animation, Scenes from Starkdale, Ohio (2007). Shots from the film are sprinkled throughout this post. Charles Sheeler and Paul Strand, still from Manhatta, 1921. End of day, end of story. 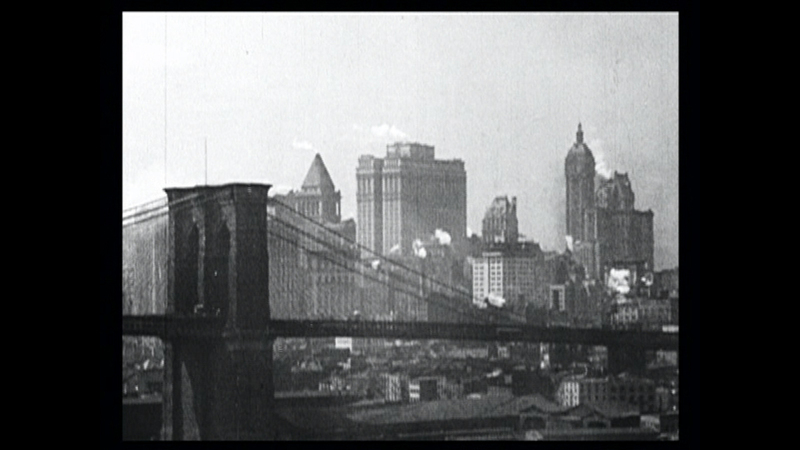 Still from Manhatta. Doug Dowd July 20, 2012 Big Day!